A steampunk mystery adventure featuring immortality, artifacts, and intrepid sleuths Sir Maurice Newbury and Miss Veronica Hobbes. So continues an adventure quite unlike any other, a thrilling steampunk mystery and the second in the series of Newbury & Hobbes investigations. The Osiris Ritual is the second in Newbury & Hobbes series from George Mann designed by Tor Books. The cover follows the same format as The Affinity Bridge, which was probably one of the best executed Steampunk cover last year having had a lot to do with the finishing details on the printed jacket with a metallic paper stock used along with copious amounts of embossing to the gears on the cover. 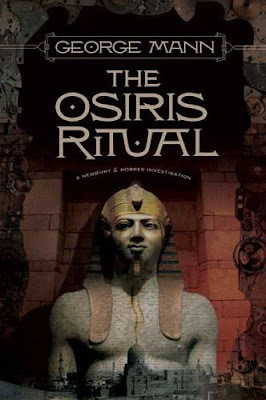 All around a splendid job so I'll have to reserve a bit judgement on The Osiris Ritual until I see the final job since at first blush this design is a little sedate. But look! A Steampunk cover without an airship! What an idea! 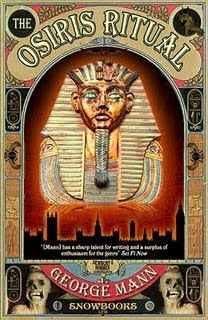 For comparison sake here is the cover for the UK edition. Again a lot of detail work going on, but I'm not fond of the color scheme.